Founders are Wes & Michelle Parker. Wes was born and raised in Sonoma County, California. This is where he was introduced to the wine industry - where grapes and wine are a way of life and vineyards right in his backyard. You might say it is in his blood. In his early adulthood, Wes worked in the wine industry in Oregon for several years. This is where his love and passion for wine developed. Wes worked with several great wineries and winemakers in the Willamette Valley while he worked at the family business Northwest Distribution and Storage. The Willamette Valley is where Wes developed knowledge and a palate for great wine and a love for the industry. A couple years after Wes started working in the wine industry, he met and married Michelle. 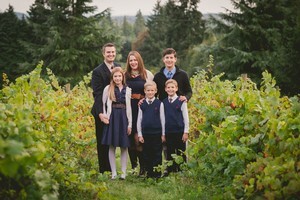 They moved to the Willamette Valley where some of our wonderful Northwest wines are created. The couple lived in the Valley for six years and regularly visited the wineries and winemakers. Their passion for wine, wine culture and the atmosphere of the wineries made a strong impression on them. After Wes and Michelle moved from the Valley, they knew that they wanted to return to the wine industry someday in the future.